Maybe we’ve learned a thing or two in our first year of cruising. Or maybe we just got lucky. It was probably a bit of both. But I had a plan to move us swiftly and safely from Marathon in the Florida Keys to Bimini in the Bahamas. A plan based on a careful analysis of the winds, currents and predicted weather. And it played out perfectly. First, some constraints. I promised Rhonda when we left Pensacola that we’d only sail overnight if absolutely necessary. She really doesn’t like it, and the truth is I’m not really a big fan either, although I’m willing to do it when it makes sense. But our weirdest occurrences have always happened in the darkest of night, like the time a flailing jib sheet rolled open the valve on one of our deck-stored scuba tanks and I thought a bomb had exploded, or our encounter with the fleet of weirdly lit UFOs (unidentified floating objects) in the middle of the Yucatan channel. Things that go bump in the night are always much less frightening if there’s no night and you can plainly see what’s bumping. Some people sail a single leg from Marathon to Bimini or Gun Cay. But it requires you to leave in the afternoon and travel through the night for arrival the next day. So I knew we needed to move closer before crossing. I’d made a promise, after all. 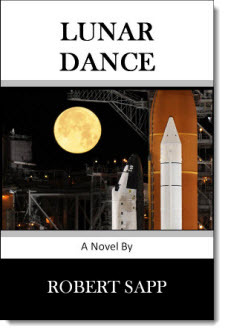 I wanted to stage the boat where we could make it across the Florida Straits in the span of a single day’s light. 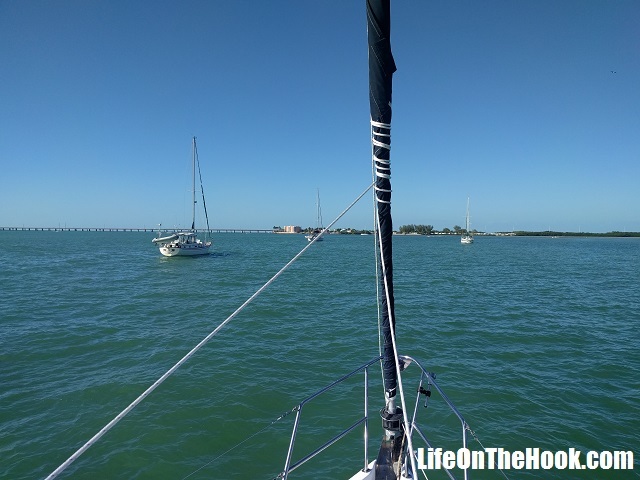 The first step was to hop up to Rodriquez Key, a trip of about 45 miles. The moderate cold front that had just blown through Marathon and cost us a night’s sleep promised a day of 15-20 knot winds from the northwest. Normally this is a bit sportier than we would prefer to head out in. When the winds get to 20 knots or higher, things can break on a sailboat if you’re not careful. The margin that allows you to make a few mistakes without hurting anyone starts getting a bit thin. But I knew that because it would be a broad reach (wind from behind the boat), it would be easier, and traveling up the Hawk Channel on the southeast side of the Keys, the islands would block the wind some and the seas would be flat. And it worked! 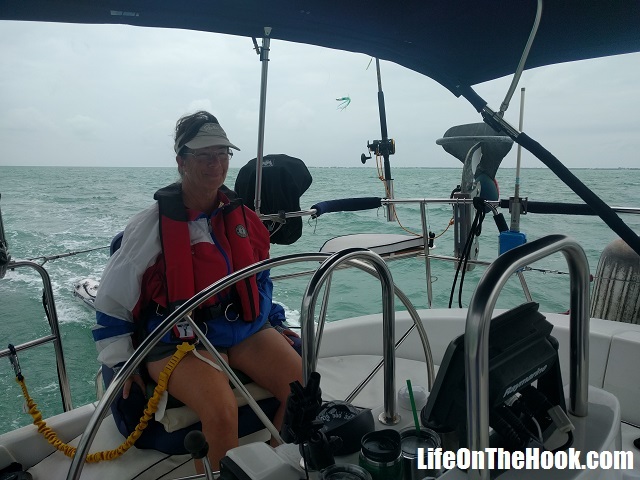 While it wasn’t a pretty day, we had a rip-snorting sail under reefed jib and double reefed main, regularly topping seven knots even though we were towing our dinghy, which was 1/3rd full of water from the following seas. A brisk downwind sail in flat seas. In case you noticed, don’t worry, Rhonda fixed her harness shortly after I took this picture. 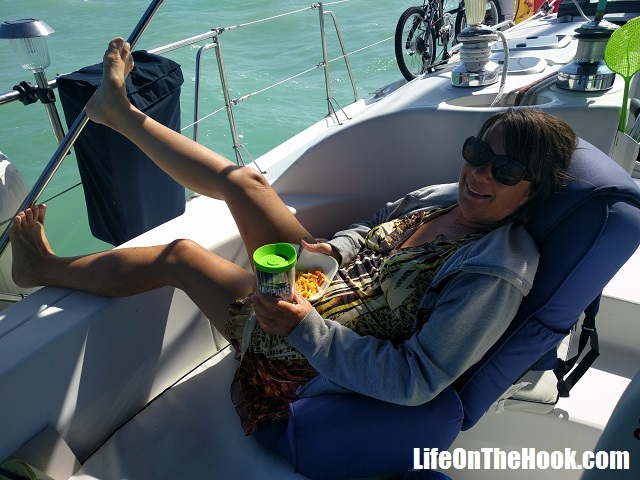 We sailed the entire way, arriving well before sunset and tucking in between Rodriquez Key and Key Largo for shelter. Even though the wind was still blowing 15 knots or more, the water was like a calm lake, and we had a good night’s sleep. 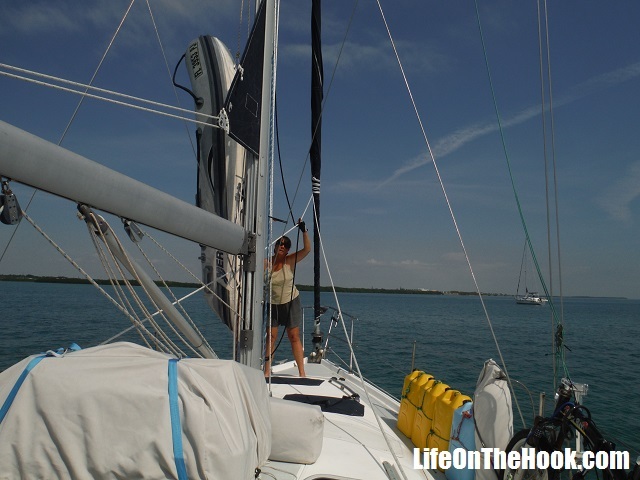 Many sail from Rodriquez Key to Bimini as a day trip. 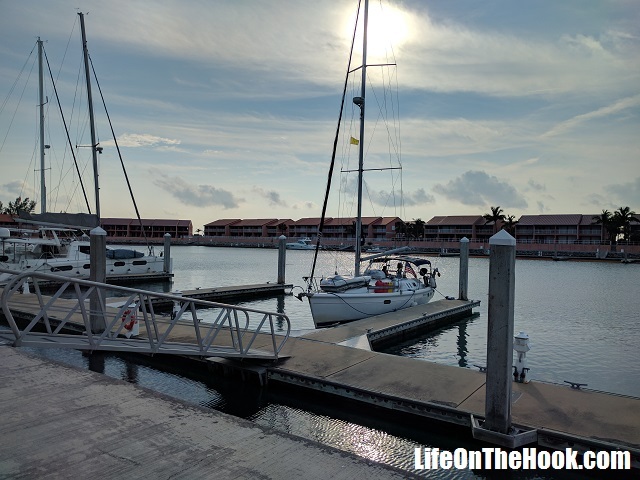 But to do it in a boat like ours, which usually travels at six to seven knots, requires leaving at around 4AM to get into Bimini by late afternoon. With sunrise currently occurring at about 7AM, this means several hours of travel in pre-dawn darkness. While we’d normally take that deal in order not to have to spend a night at sea, there was a big problem. This time of year, the entire area is heavily mined with crab traps, since it’s the season. And a 4AM departure meant one of us (probably me) would have to spend several hours sitting on the bow with a spotlight searching for a clear path, until we made deep water or it got bright enough to see the traps. Miss one crab trap, sail across it and tangle the prop, and then we’d be drifting until it got light and we could break out the dive gear to cut ourselves free. No thank you. So we had to move even further toward our goal to stage for our crossing. At this point, we were only 24 miles southwest of Angelfish Creek at the northern end of Key Largo, a popular jumping off point for people headed to the Bahamas. An easy four hour trip, especially since the weather for the second day of our trip was supposed to be calm with a light southeast wind. So we took advantage of the conditions and motored though mostly placid seas, arriving in mid-afternoon. Bringing our dinghy on deck gains us an extra half knot of speed when traveling. This is where I decided to take a bit of a gamble. Entering Anglefish Creek from the Atlantic Ocean side to reach the protected anchorages within requires clearing a shallow bar. Our cruising guidebook said to be extremely cautious if your draft exceeds four feet, and with our five foot draft and a dropping tide, it was a chance I just didn’t want us to take. 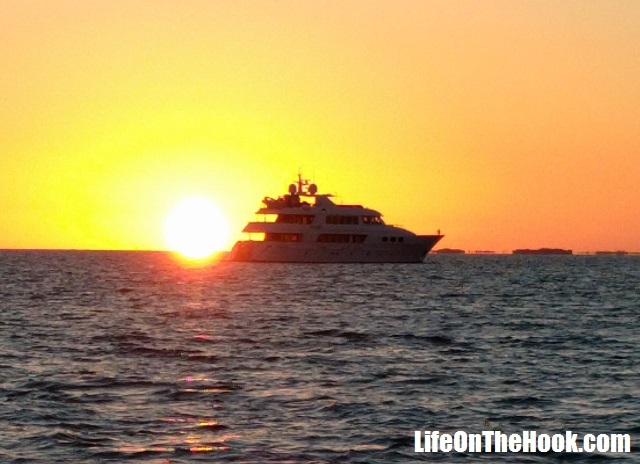 Instead, we decided to anchor north of the mouth of the creek (off Old Rhodes Key}. 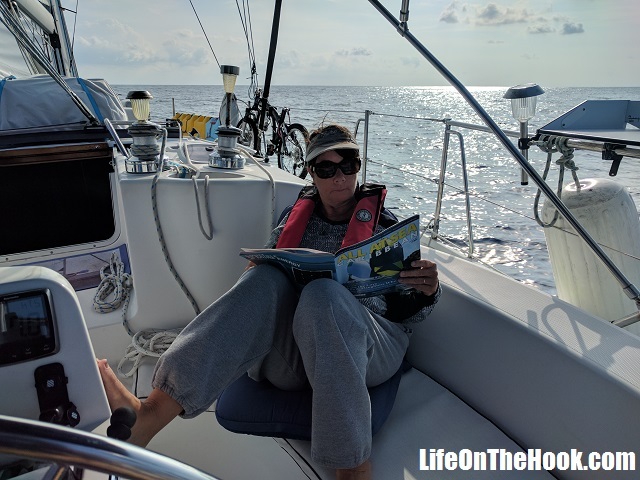 It’s not marked as an anchorage in any of the guides and it was a location that was completely exposed to the south and east, but the prediction was for 5-10 knot southeast winds through the night, and the sandy bottom meant our anchor would set well. So counting on the mild conditions, we basically dropped anchor on the edge of the ocean off a lee shore (wind blowing toward the land, which can be dangerous). Not only did this save us from having to cross a shallow bar twice at low tide (once to enter the creek and anchor, and again on the way back out), but it put us almost an hour closer to Anglefish Pass through the offshore reef to gain the open ocean the next day. And that extra hour made a daylight-only crossing to Bimini very doable! The prediction was accurate, the winds blew sedately from the southeast, and we had a pretty decent night. Getting up before the sun the next day, we were underway at 7AM, and had about 45 minutes of avoiding crab pots and crossing the reef, and then we were in two thousand feet of water with nothing but 54 miles of open ocean between us and our destination. A mild southerly breeze calmed the northward flowing Gulf Stream, and we motored-sailed in two foot swells as the miles flew by. We pointed the bow about 15 degrees south of our destination, and let the rapidly moving stream sweep us northward, the current adding to our speed, which topped 8 knots at times. We saw humpback whales. We saw the purple-blue crest of a sailfish broach alongside us as he checked us out. We saw the ocean change colors from blue to bluer to bluest. We clearly saw freighters crossing our path from miles away rather than as colored blobs on our radar and AIS screens. In the end, it was worth it. We enjoyed so many things that we would have missed traveling in darkness. All the routing and planning and waiting for suitable weather resulted in our having the easiest Gulf Stream crossing we could expect. Unfortunately, others were not as lucky. 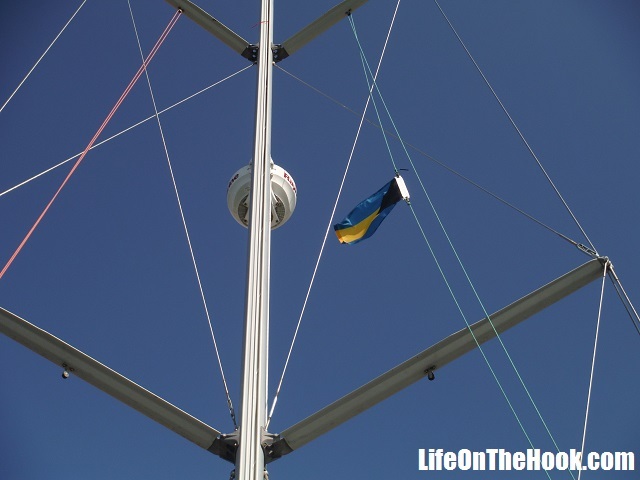 The VHF crackled with calls from boaters requesting offshore towing or assistance. We listened raptly for an hour as a sportfishing boat sank 20 miles off Bimini, and the 300 foot mega-yacht Tatoosh (apparently owned by Paul Allen) vectored to their position to rescue three people in the water. 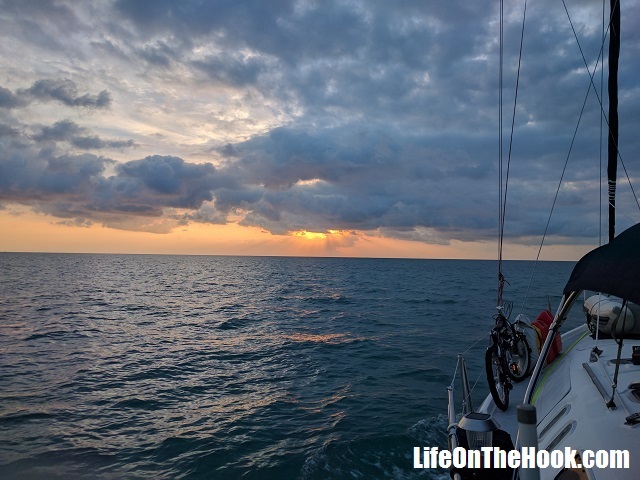 We heard the next day that a sailboat sank in the darkness after our crossing. A friend of mine and fellow cruiser recently commented that those of us who chose this life sometimes don’t realize how close to the edge we actually live. I prefer to think that this life rewards the cautious and punishes the foolhardy. Maybe all of our careful planning and weather analysis paid off. Or maybe we were just lucky. But to paraphrase something a famous man once said, we feel we’ve been very lucky in this life we’ve chosen, and we’ve found that the more we plan and prepare, the luckier we get. We arrived at the Bimini Sands Marina and Resort at 3:30 in the afternoon, two months and a day after leaving Pensacola (yes, we took the scenic route). We had plenty of time to unstow and assemble our folding bikes and peddle the two miles to the airport to clear customs and immigration. Our Bahamas courtesy flag is now flying, and Eagle Too has safely delivered us to our third foreign country in the last year. 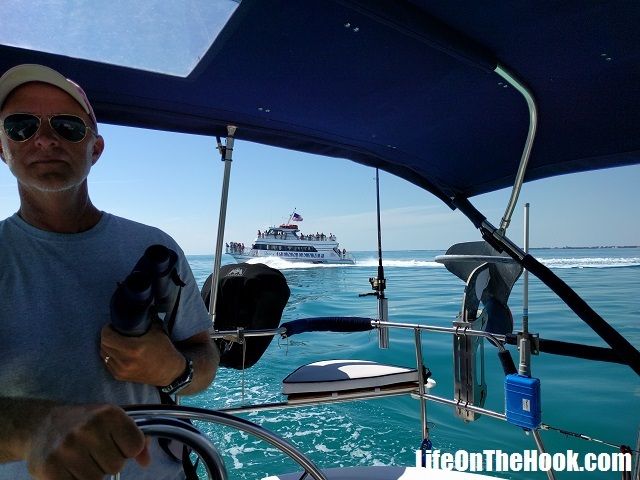 This entry was posted in Uncategorized and tagged Crossing the Gulf Stream, Cruising to the Bahamas, Marathon to Bimini on February 20, 2017 by Robert.